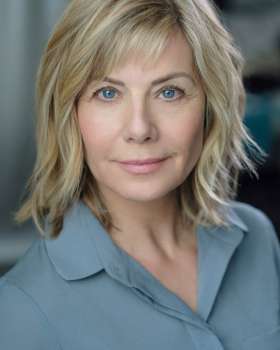 Glynis is best known as one half of the hugely and globally successful cop series, DEMPSEY & MAKEPEACE, as well as series regular roles in EASTENDERS (BBC), THE ROYAL (ITV) and EMMERDALE (ITV). She next films THE OUTPOST Season 2(NBC Universal/The CW) & LONDON KILLS (AcornTV). Glynis has an extensive Television CV and her recent credits include ROYAL HEARTS (due for release in February 2018), AGATHA CHRISTIE'S MARPLE: ENDLESS NIGHTS (ITV), LAW & ORDER (ITV), CASUALTY (BBC), BAMBOO (BBC), NEW TRICKS (BBC) and TRIAL & RETRIBUTION X (ITV). Film credits include POINT BREAK, EDGE OF TOMORROW, HAMMER OF THE GODS, ON THE NOSE (alongside Dan Ackroyd & Robbie Coltrane), THE FAIRY KING OF AIR (alongside Malcolm McDowell), DEJA VU (alongside Vanessa Redgrave & Stephen Dillane), JEKYLL & HYDE (alongside Anthony Perkins), THE HOUND OF THE BASKERVILLES (alongside Ian Richardson & Martin Shaw), THE WICKED LADY (alongside Faye Dunaway & John Gielgud), THE TRANGLER ARRANGEMENT (alongside Billie Whitelaw & Ronnie Cox) and YESTERDAY'S HERO (alongside Ian McShane). Theatre credits include THE BEST MAN (West End & UK Tour), STALKING THE BOGEYMAN (Southwark Playhouse), Original London Cast of BEAUTIFUL: THE CAROLE KING STORY (Aldwych Theatre), LOVE LETTERS (Dundee Rep), SEASON'S GREETINGS (UK Tour), SEPERATE TABLES (The Mill at Sonning), THE GRADUATE (UK Tour), MACBETH (Shakespeare Festival), MAKE ME A MATCH (The Mill at Sonning), KILLING TIME (UK Tour), HIGH FLYERS (Churchill Theatre, Bromley), SAME OLD MOON (Nuffield Theatre), SUMMER BREEZE (Gate Theatre), ONCE IN A LIFETIME (RSC/Piccadilly Theatre), A MURDER IS ANNOUNCED (Vaudeville Theatre) and RING ROUND THE MOON, WHAT THE BUTLER SAW, THE NORMAN CONQUESTS, REBECCA, BLACK COMEDY and THE BROWNING VERSION (all at Theatre Royal Northampton). Aside from Glynis' career as an actress, she has been busy working on Ageless, her hugely popular anti-ageing website. Glynis is fast becoming the go to person for tips on how to stay looking young and healthy. For more information please visit agelessbyglynisbarber.com. Glynis, along with nutritionist Fleur Borelli, recently released their debut health book THE IN-SYNC DIET. It reached no.1 in category on Amazon UK on it’s launch and also went straight into Amazons’ overall top 10. It made the top 20 in eBooks Health/Mind & Body chart via iTunes UK. It became Waterstones 4th most popular diet book and also made the top 20 on the Independent bookstore overall list.